Rio de Janeiro may not rank highly in the list of obvious choices for a family vacation, yet there are plenty of child-friendly options in the city. Brazilians tend to be incredibly accommodating with children and you will feel welcome there with your family in tow. Here are some great activities you can do with children. One of Rio’s newest attractions is the aquarium. With a well-organised structure and teeming with a rich diversity of marine life, it is something children will love. During the week is the best time to go as not only will you avoid the weekend crowds, there is also the touching tank activity on weekdays where visitors can touch various species of marine life. The shark tank, a tunnel that runs through a huge aquarium with sharks swimming above and to the sides, will appeal to adults and kids alike. Take a day trip from Rio de Janeiro to Angra dos Reis, a small coastal town just one hour’s drive from the city. From there, you can take a 30-minute boat trip over to Ilha Grande, an island defined by its paradisaical beaches, crystal clear waters, and tropical forests. It’s possible to go and return on the same day, but the real joy comes from spending a couple of nights there to go exploring forest trails and snorkelling among the exotic marine life. 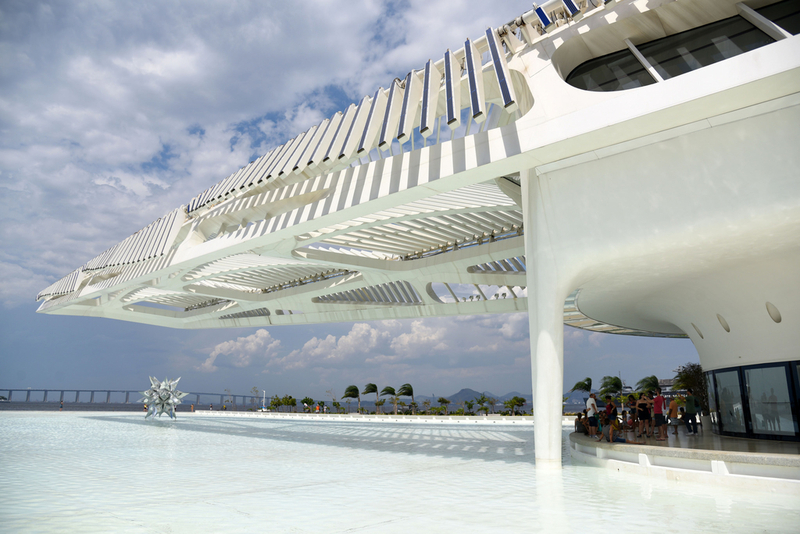 Another new attraction to the marvellous city is the Museum of Tomorrow. The striking futuristic architecture is as fascinating as the interactive and informative displays inside. Visitors are guided through a wealth of information that discusses sustainability and future possibilities of our planet considering factors such as climate change and war. Insightful and stimulating, the colourful displays that are abuzz with stunning images will keep kids and adults entertained for hours. The information is available in several languages. The botanical gardens are one of Rio’s most beloved and most-visited tourist attractions. Teeming with thousands of species of exotic plants, kids can spend a pleasant afternoon identifying the many birds, insects, and flowers that thrive there. The garden has special features such as a Sensory Garden that has been created to let children touch and smell unique plant species. Just outside the gardens are several museums with collections of insects and orchids, in addition to a French bakery that makes an ideal spot for a satisfying lunch. The lake known as Lagoa in the south zone of the city is a great place for kids. The 7.3-kilometre cycle path that encircles the lake is flat and smooth, making it ideal for a pleasant bike ride whilst enjoying the gorgeous scenery and peaceful ambiance. Bike hire is available from one hour up to a day’s rental. You can also take kids out onto the lake on a swan boat, which is a great way to spend an easy, fun hour. The abundance of rustic-styled restaurants dotted around the lake provide plenty of lunch and dinner options. Keep an eye out for the resident wild capybara. The Sugarloaf Mountain is one of Rio’s most iconic monuments and appeals to both kids and adults. Adults will probably appreciate the panoramic views whereas children will love the cable cars going up to the summit. The cable car starts at Praia Vermelha in Urca and makes its first stop at Morro da Urca. From there, you can get off and enjoy the snack bars and restaurants on top of the first peak before making the final leg of the journey over the sea and up to the Sugarloaf. Kids tickets are half price. Petropolis is a colonial city just one hour away from Rio de Janeiro and makes a great day trip. In addition to attractions such as the Imperial Palace and the House and Museum of Santos Dumont, the Serra mountain range is nearby, creating great hiking experiences that kids will love. The nearby Bohemia beer factory sounds more appealing to parents, yet the interactive guide that shows how beer is made will be fascinating to kids too.